A significant rate still does not make it a sufficient rate. It could be an important process in relation to the smaller amount of nucliation represented by that mechanism. Yes, meaning the growth of this insufficient number of nuclei ito the size to seed cloud droplets is not guaranteed and that number may decrease. Yes, it is of interest, whcih is a major reason why the experiment was undertaken in the first place. That still does not change the fact the rate was insufficient to account for the observed nucliation. That's a little bit different than what you are trying to portray, Wayne. No, you are just ignoring the statements that you dislike. Note that the Boundary layer could be as low as a few meters from the surface, but it is largely dependent on the local meteorology. Low Clouds can be as high as 6,500-8,000 feet, so GCR induced ionization could play a prominent role in the formation of low clouds in the troposphere, as hypothesized by Svensmark. Odd you left out this portion of the statement following "could be as low as a few meters from the surface to several kilometres"
It it were the direct influence some suggest, why would the disconnect occur in the last 50 years? If one looks at the trend from 1950 for both sets of data, so there is no cherry-picking, the trend in temperature is not seen in the cosmic rays. There is no disconnect over the last 50 years. Or could it the other way around? What could be the other way around? Where does it say that this rate is not sufficient enough to account for a significant portion of observed nucleation? and could be quite large when averaged globally over the troposphere. Not necessarily, as until there is some evidence of an effect there is no connection to add uncertainty. So the Forbush Decreases probably impacting precipitation, the Diurnal Temperature Range impacts, the remarkable correlation with cloud cover and temperature, and the CERN experiments do not warrant uncertainty? No, the uncertainties in your preferred hypothesis start with the lack of evidence for a mechanism, which is not the case with GHG. So where is the evidence that Greenhouse Gases are causing Global Warming? Actually, there is. The rise in CO2 levels in the atmosphere coupled with the evidence of how GHGs work gives a theory supported by measurements .... unlike the cosmic ray mechanisms. Ummm, and where's the evidence that they are causing Global Warming? The results of the CERN experiments which showed an insufficient level of nucliation for observed climate impact even with the multiplication factors included. Which is not stated at all anywhere in the paper. Last edited by Snowy123 on Sun Jun 03, 2012 1:15 pm, edited 1 time in total. Current global warming commonly is attributed to increased CO2 concentrations in the atmosphere (3). However, geophysical, archaeological, and historical evidence is consistent with warming and cooling periods during the Holocene as indicated by the solar-output model. The current warm period is thought to have not reached the level of warmth of the previous warm period (A.D. 800-1200), when the Vikings raised wheat and livestock in Greenland. Therefore, the magnitude of the modern temperature increase being caused solely by an increase in CO2 concentrations appears questionable. The contribution of solar-output variations to climate change may be significant. From the frequencies of sunspot and aurora sightings, abundance of carbon-14 in the rings of long-lived trees, and beryllium-10 in the annual ice layers of polar ice cores, we have reconstructed the history of a variable Sun. In the last 1,800 years, the Sun has gone through nine cycles of changes in brightness. While these long-term variations account for less than 1%of the total irradiance, there is clear evidence that they affect the Earth's climate. Some studies indicate that the solar modulation of galactic cosmic ray (GCR) particles has profound consequences for Earth's climate system. A corollary of the GCR-climate theory involves a link between Earth's magnetic field and climate, since the geomagnetic field also modulates the GCR flux reaching Earth's atmosphere. In this study, we explore this potential geomagnetic-climate link by comparing a new reconstruction of the Holocene geomagnetic dipole moment with high-resolution speleothem data from China and Oman. The speleothem δ18O data represent proxy records for past precipitation in low-latitude regions, which is a climate parameter that is likely to have been sensitive to variations in the GCR flux modulated by the dipole moment. Intriguingly, we observe a relatively good correlation between the high-resolution speleothem δ18O records and the dipole moment, suggesting that Earth's magnetic field to some degree influenced low-latitude precipitation in the past. In addition to supporting the notion that variations in the geomagnetic field may have influenced Earth's climate in the past, our study also provides some degree of support for the controversial link between GCR particles, cloud formation, and climate. Galactic cosmic ray (GCR) changes have been suggested to affect weather and climate, and new evidence is presented here directly linking GCRs with clouds. Clouds increase the diffuse solar radiation, measured continuously at UK surface meteorological sites since 1947. The ratio of diffuse to total solar radiation—the diffuse fraction (DF)—is used to infer cloud, and is compared with the daily mean neutron count rate measured at Climax, Colorado from 1951–2000, which provides a globally representative indicator of cosmic rays. Across the UK, on days of high cosmic ray flux (above 3600×102 neutron counts h−1, which occur 87% of the time on average) compared with low cosmic ray flux, (i) the chance of an overcast day increases by (19±4) %, and (ii) the diffuse fraction increases by (2±0.3) %. During sudden transient reductions in cosmic rays (e.g. Forbush events), simultaneous decreases occur in the diffuse fraction. The diffuse radiation changes are, therefore, unambiguously due to cosmic rays. Although the statistically significant nonlinear cosmic ray effect is small, it will have a considerably larger aggregate effect on longer timescale (e.g. centennial) climate variations when day-to-day variability averages out. Current concern over ‘greenhouse’ warming and possible human influence upon global climate has been countered by claims that recent advances in solar theory demonstrate a greater role than previously thought for solar forcing in recent climate change. This is still disputed for this century, but new evidence from a range of palaeoenvironmental indicators lends strong support to the notion that not only the long-term (105 to 103 years) climate changes of the Pleistocene but also short-term (101 to 102 years) climate changes in the Holocene may derive in large or small part from solar variability. Evidence from recent research into proxy climate records is reviewed and set in the context of recent advances elsewhere in studies of late Quaternary palaeoenvironments and in solar science. They may not be usre how they got an increase too ..... you quote a source that you have questions concerning the accuracy to support your belief. That is not science but more of a religion. They warrant investigation, but without some evidence of mechanism the only uncertainity is whatever one wished to believe. I can believe there is a Martian heat ray being used by a spaceship cloaked from detection and claim uncertainty because I have created it in my mind. There is no evidence to support that uncertainty, so in the realm of reality it does not exist yet. If and when there is evidence then the real uncertainty can exist. In several hundred years of science, which you ignore in favor of conflicting and unsupprted hypotheses from the blogosphere. CO2 is a GHG, which is proven in experimentation. GHGs retain energy and warms our planet, which is proven in many ways. Humanity has released more sequestered CO2 than required for the increase in the atmosphere. Thus, the theory is formed using real evidence. They have been proven to absorb and re-radiate energy causing the retention of said energy as heat. There are various other lines of evidence to support this theory, such as warming more during night hours. Only in the case of your position. Yes, it is. If it is insufficient to account for the observed nucleation it is insufficient to account for any impact connected with that nuclealtion. However, even with the large enhancements in rate due to ammonia and ions, atmospheric concentrations of ammonia and sulphuric acid are insufficient to account for observed boundary-layer nucleation. Can you highlight me the empirical evidence in that report that shows that most of climate change is anthropogenic, please? There is plenty of evidence, though. And I can do the same "proof" with the sun. 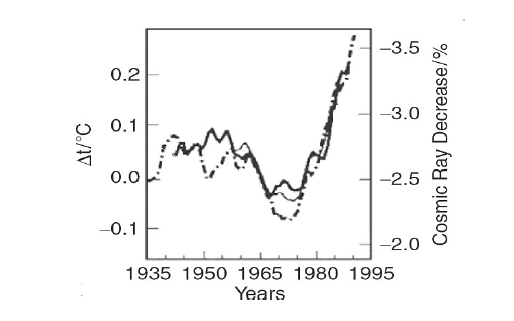 The sun's activity has correlated with temperatures in the past over various timescales, (See Figure 1) and is known to impact temperatures with an increase in solar radiation, and a cloud decrease from Cosmic Rays. Increased Solar radiation warms the planet, which is a basic fact. (Figure 1) From Figure 6 of Scafetta and West 2007. 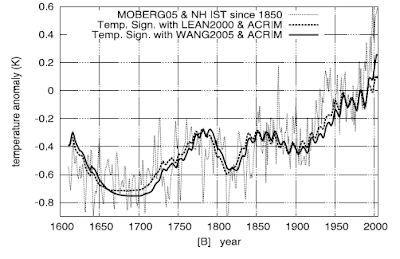 The strong coherency between solar activity and temperature changes can be observed over the last 400 years. 89, 26 and 10.4 years), which are assigned to solar modulation7. So in other words, what you have just done is presented a correlation and not causation, and a proof that CO2 is not causing zero warming. That is nice, but a better proof would be a proof that CO2 is causing most of the warming observed. That is not a fingerprint of AGW due to Greenhouse Gases, as many things, including warmer oceans and urbanization both reduce the Diurnal Temperature Range. No, it does not say that GCRs do not cause a significant change in the nucleation rate in the troposphere or the boundary layer, so your logic is quite flawed. The period of natural temperature variations in that period of history should correlate very well. The problem is the recent period. A correlation with an evidenced mechanism is evidence of causation in such a case. Unless you have a duplicate uninhabited planet to use as a control, that is as close as it can get. It clearly states the measured nucleation rates were insufficient to account for the observed rates in the boundary layer. Thus, the observed nucleation rate and the impact from clouds formed by the observed nucleation rate cannot be attributed to the GCRs. There may be an impact, but not of the magnitude you have claimed. The logic is quite sound.